Prevention is key to a healthy mouth. In our philosophy at Ottawa Children’s Dentistry it is better to prevent a problem altogether rather than experience one. Even minor tooth decay can result in toothaches, tooth sensitivity, and pain when eating. When left untreated, decay can lead to more serious issues including tooth loss, pain, or infection. At Ottawa Children’s Dentistry we want your child to feel great all of the time, so we believe it is best to avoid tooth decay in the first place. Our goal is to educate your child about preventative dentistry, and help them develop great oral hygiene habits that will lead to a lasting, healthy smile. Just like you take your child to a pediatrician every year for a well-child check-up, it is important to also bring your child to a pediatric dentist who is trained in children’s dentistry for regular visits to make sure that everything is going well, look for any potential problems, and discuss your concerns with you. This is where dental health starts. There's just no substitute for physically removing disease- causing dental plaque and calculus (tartar) from your child’s teeth — especially near the gums. That's why regular professional cleanings are so important to their health. 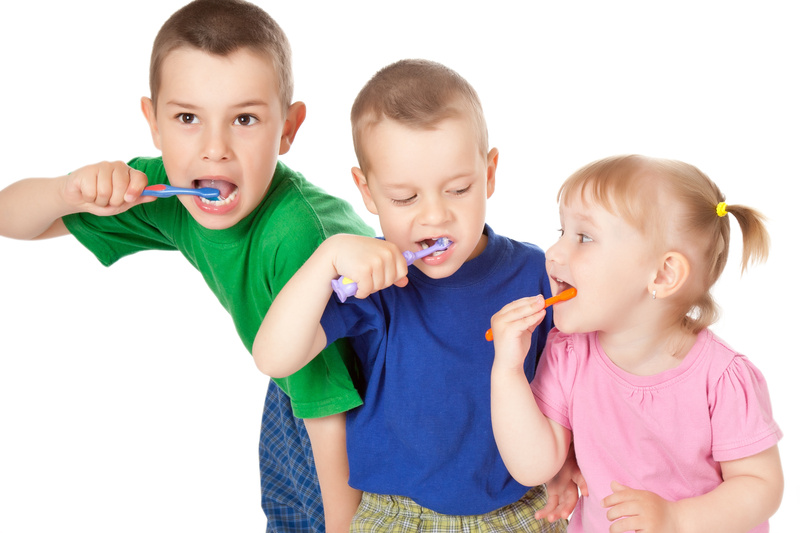 Kids are awesome with wanting to participate, though brushing their teeth is often challenging for them. It can be difficult for them to reach every bit of plaque. Even if you brush and floss your child’s teeth faithfully twice daily, it is important that you have their teeth professionally cleaned on a regular basis. (Of course, if you aren't quite so meticulous about their oral hygiene, it's even more important!) After a thorough cleaning, your child’s teeth will feel smooth and squeaky-clean, and they will probably look a lot brighter too. But professional teeth cleanings aren't done for looks alone. Why do your child’s teeth need this kind of attention? Essentially, it's because over time they tend to build up a layer of plaque (a sticky, bacteria-rich film) and hard deposits (called tartar, or calculus), which can only be removed with professional dental instruments. When these deposits are allowed to remain on the tooth surfaces or below the gum line, they provide ideal conditions for bacteria to grow and multiply. Some of these bacteria create acids which cause tooth decay and gum disease; if left uncontrolled, this can lead to inflammation and infection of the gums, and possibly influence systemic (whole body) diseases. Our dental team is skilled at working with children and delivering cleanings that are both thorough and gentle. The team makes each experience in our office a great one by offering positive encouragement and rewards, resulting in your child looking forward to their next dental visit. 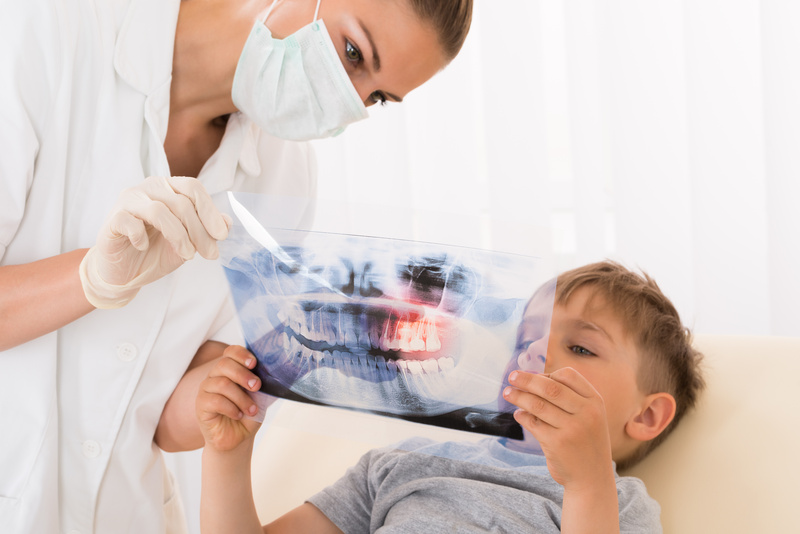 Radiographs (X-Rays) are a vital and necessary part of your child’s dental diagnostic process. Without them, certain dental conditions will be missed. Pediatric dentists are particularly careful to minimize the exposure of their patients to radiation. At Ottawa Children’s Dentistry, we follow The American Academy of Pediatric Dentistry recommendations for radiographs based on a child’s risk of tooth decay. With contemporary safeguards, the amount of radiation received in a dental X-ray is extremely small, thus making the risk almost negligible. In fact, the dental radiographs represent a far smaller risk than an undetected and untreated dental problem. Body aprons and shields will protect your child, as well as high-speed film to assure that your child receives a minimal amount of radiation exposure. Fluoride has been shown to be beneficial to teeth. The protective outer layer of teeth, called enamel, is often subject to attacks from acids. These can come directly from acidic foods and beverages, such as sodas and citrus fruits — or sometimes through a middleman: the decay-causing bacteria. These bacteria gather in dental plaque and feed on sugar that is not cleansed from your child's mouth. In metabolizing (breaking down) sugar, these bacteria produce acids that can eat through tooth enamel. This is how cavities are formed. When fluoride is present, it becomes trapped in the tooth structure, thereby making the tooth stronger and more cavity resistant. Fluoride can even reverse tiny cavities that are starting to form. While there is a small amount of fluoride in toothpastes and in some drinking water supplies, we can apply a higher concentration onto your child’s teeth for maximum protection. A sealant is a tooth colored material that is applied to the teeth where decay occurs most often - the chewing surfaces of the back teeth. If you run your tongue over this area in your mouth, you will feel the reason why: These surfaces are not as smooth as other areas of your teeth are. Instead, teeth are filled with tiny grooves referred to as “pits and fissures,” which trap bacteria and food particles. The bristles on a toothbrush can't always reach all the way into these dark, moist little crevices. This creates the perfect conditions for tooth decay. The sealant acts as a barrier to keep bacteria and food out of the pits and grooves of the teeth. Fast and comfortable to apply, sealants can effectively protect teeth for many years by preventing cavities from forming and the need for fillings later on. Baby teeth, also known as primary or deciduous teeth, not only perform the job of chewing and help your child speak properly, they also provide a guide for your child's permanent teeth to emerge in the correct location. When your child loses a tooth early, it means that they also lose the guide for their permanent tooth. Without their baby tooth as a guide, their permanent tooth may not have enough room to grow in properly, or it may grow in at an odd angle. When this occurs, your child faces a misaligned bite and potential complications. Naturally, we do our best to help your child keep their primary teeth until they come out naturally. Of course, where kids are concerned, not everything is predictable, and they could lose a tooth due to an accident or trauma, deep decay requiring an extraction, or a tooth missing from birth. When that happens, a space maintainer can help your child’s permanent teeth grow in properly.Naturally, we do our best to help your child keep their primary teeth until they come out naturally. Of course, where kids are concerned, not everything is predictable, and they could lose a tooth due to an accident or trauma, deep decay requiring an extraction, or a tooth missing from birth. When that happens, a space maintainer can help your child’s permanent teeth grow in properly. A mouthguard should be a top priority on your child’s list of sports equipment for athletic activities-whether they’re playing on organized sports teams, bicycling, or just kicking the ball around. 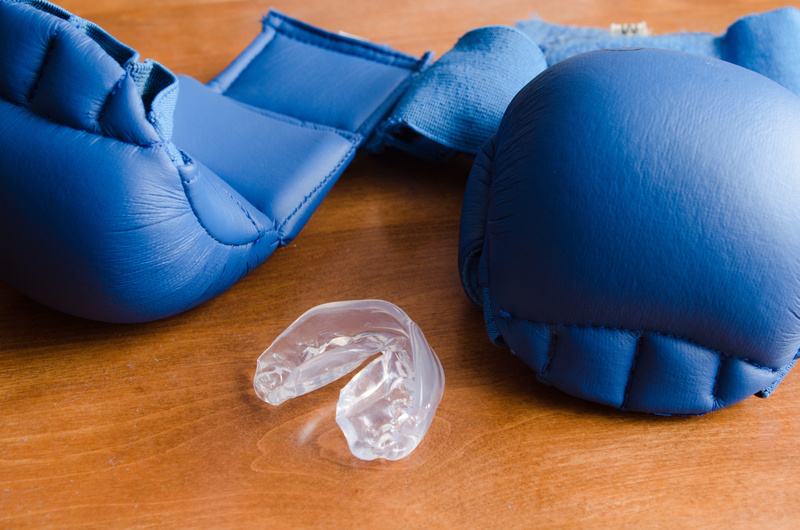 According to the American Dental Association (ADA), athletes who do not wear mouthguards are 60 times more likely to suffer dental injury than those who do not. Besides being painful, a child's sports-related dental injury can mean time lost from school and work, plus substantial cost (replacing a missing permanent tooth can cost up to $20,000 in a lifetime). A properly fitted, comfortable mouthguard, worn at practice and games, acts as a safety device to greatly reduce the likelihood of serious dental injury by protecting the child’s teeth, lips, cheeks and gums. Any mouthguard that a child wears is likely to be useful, but it’s also important to understand the different types available to choose from. Available at many sporting goods stores, this type comes in a limited range of sizes, and varies widely in quality. The least expensive option, it offers a minimal level of protection that's probably better than nothing. It generally must be clenched in the mouth, which can make wearing it uncomfortable and cause trouble breathing and speaking. The “boil and bite” mouthguard. These are designed to be immersed in hot water, and then formed in the mouth using finger, tongue and bite pressure. When they can be made to fit adequately, they generally offer better protection than the first type—but they may still be uncomfortable, and usually fail to offer full coverage of the teeth. The bottom line: the best mouthguard for your child is the one he or she actually wears. Talk to your pediatric dentist about which one is right for your child and best fits your family’s needs.